Since Google announced they were closing Google Reader down in June, people have been scrambling to find something to use in it’s place. I’m not sure what the rush is, but I was caught up in it too. My replacement of choice is Tiny Tiny RSS because it’s self hosted, meaning I don’t have to rely on any third party for such an important task any more. This article is not about how to set up TTRSS (Tiny Tiny RSS). That’s been covered by the official Wiki and Forums. This article is about how to make TTRSS behave somewhat more like Google Reader, so you can jump right back in to reading feeds and not have to learn something new. First up are the settings you can change straight out of the box. Open Preferences - the link is the first item in the ‘Action’ menu at the top right of the main interface. Set up the above options as shown. 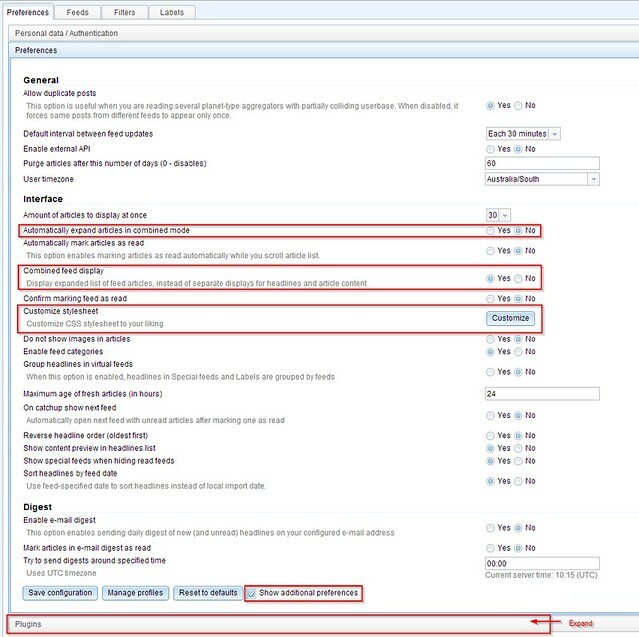 To access ‘Automatically expand articles in combined mode’ you need ‘Show additional preferences’ ticked. ‘Combined feed display’ switches the view from 3-pane view to two-pane. 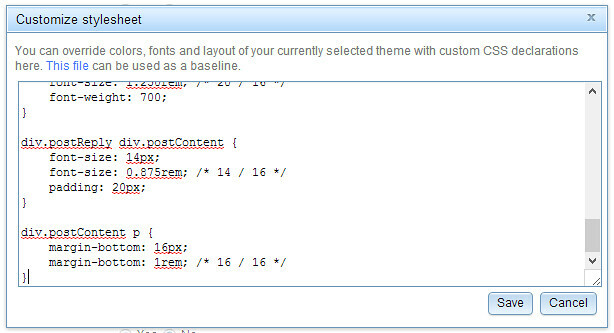 While you’re in Preferences, click ‘Customize’ under ‘Customize stylesheet’ and paste in the code found in this Gist by Gregory Rickaby to get TTRSS looking a bit more like Google Reader (if that’s your bag). 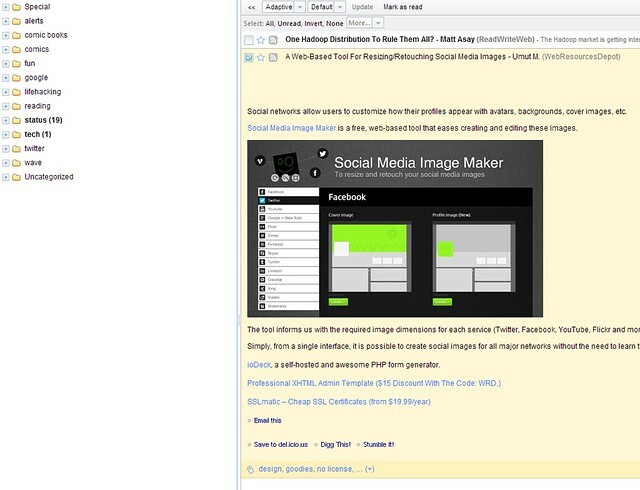 Mark Waters created a Google Reader Shortcut plugin. Developer fox has already merged it into the software, but if like me you downloaded the version before the plugin was incorporated, you can create a directory called ‘googlereaderkeys’ in the plugin directory, and in that create a file called init.php. Paste the code from Mark’s plugin in that file and save it to your installation. This will enable the familiar j/k keystrokes to navigate feeds and ‘v’ to open them. Alternatively you could get used to the native keystrokes n/p for next/previous. 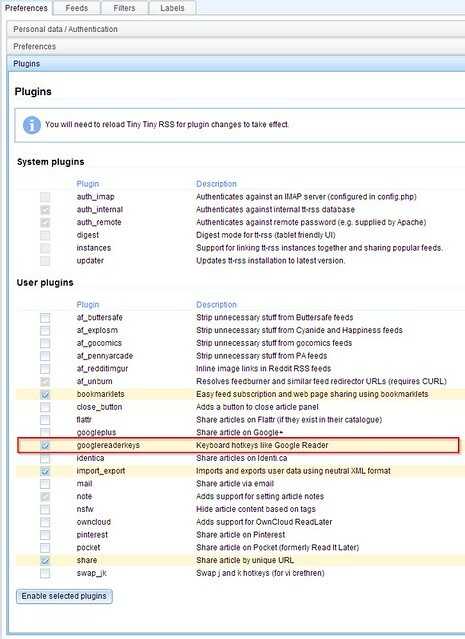 Don’t forget to visit the plugin page and enable this new plugin. Next up is collapsing expanded articles by clicking on the headings again. Based on fox’s patch, open up the file ‘js/viewfeed.js’ in a text editor. And save it back to your installation. There are a few more tips around including how to import starred and shared items into TTRSS. Tiny Tiny RSS is a fantastic product that fills the void left by Google Reader. I highly recommend donating too - Andrew Dolgov has been working tirelessly, since the Google Reader announcement, to keep on top of endless support requests. Got any other tips you’re using? June 2013: I am no longer using this software myself. This post was written in support of an independent developer who I believe has built a terrific product and released it for free for anyone to use. You’re still free of course to use Tiny Tiny RSS, but I can no longer recommend it. While the developer works hard and is constantly updating and fixing his software, I find his customer service manner to be beyond rude. He’s never been rude to me personally so this isn’t sour grapes, but his forum and other interractions are littered with examples of unnecessary rudeness. If you want good software, and will never need assistance please go ahead and use TTRSS. Personally, I switched from Google Reader to a self-hosted solution so that I wouldn’t need to switch again. However, I’m not convinced that I will able to get help with the product in future without following the developers unwritten rules for support. I’m certain the developer will not miss me. TL;DR Developer is unnecessarily rude and I don’t want to support rude people.